My story goes back to 2006. I felt inspired to study Broadcast Journalism at Brigham Young University. As I studied journalism I felt strongly there were video projects I should do for my career. After serving my two year LDS mission in Argentina (2008-2010) I started conducting informational video interviews and creating websites with Wordpress. In September 2012 I felt inspired to create a video resource for pre-missionaries. So I quit my job and began the Prepare to Serve video project, where I've been involved in video interviewing more than 800 returned missionaries and have edited and published more than 12,000 YouTube videos. During the past few years I've felt strongly that there's another video project I need to pursue. That project is called Lifey. The vision of Lifey is to collect human experience and insight through video and make it accessible to people who could benefit from those experiences and insights. Another aspect of the inspiration behind Lifey is the sad reality of how many people pass away without leaving a high quality video life history for their family and close friends. It's so easy and simple to record high quality video histories, that it's a shame not more people do it. Most people I talk to express interest in recording their life history, or the life history of their parents or grandparents, but only the super ambitious people actually get it done and those who get it done often do a less-than-perfect job, or pay an arm and a leg for a video life history service that is sub par. I believe everyone should create a Lifey (a video selfie of their life story). Everyone has meaningful experiences and insights. So much value can be preserved and so many relationships can be strengthened by sharing those experiences and insights with each other. Lifey is the best, most accessible way to share those experiences. 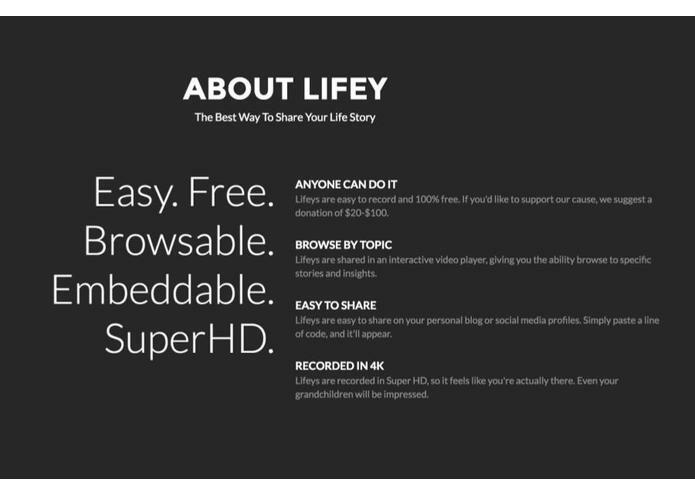 The Lifey player allows viewers to browse in-depth (2-3 hour) video life histories by topic and story/insight. The Lifey player is mobile-friendly and is embeddable on websites and blogs. I've had four years of experience conducting hundreds of in-depth video interviews with people about their lives (primarily about their mission experiences and health conditions). I'm a fan and major consumer of video interviews posted on YouTube and believe that the video interview format is underutilized because it's generally not easy to browse long-form video interviews. So I conceptualized the Lifey player to make talking head videos more accessible and paid my friend Christopher to develop the first iteration of the Lifey player. The current version of the Lifey player is fully functional, but there are several features we plan to add to the video player soon. The videos are shot in 4K on a Panasonic GH4 in our video recording studio. For starters, I was essentially clueless about videography four years ago when I quit my job to work on video interviews (as is evidenced by looking at the first 100 or so video interviews I published). Through trial and error our video quality has progressed to the quality of the 90-second video demo I linked to below. As far as developing the Lifey player it took a few iterations to create a Lifey player that would be mobile-friendly, embeddable, and would allow endless tabs and make one video browsable or multiple videos browsable. The video player, videos and website are constantly evolving as we receive feedback and insight. I'm proud of how many lives we've been able to touch through our video interview projects. Our talking head videos have been viewed on YouTube more than 20 million times. I'm grateful I've had the stamina to tackle such large projects without giving up. I can't attribute the success we've had to my own efforts, I ultimately feel this is a project inspired of God and He's been behind any of the success we've seen so far. I'd be clearly dishonest if I did not recognize His hand. He's prepared the way thus far, and will continue to prepare the way as long as I do my part. Ha! Where to start? I've learned sooo much about sooo many things. Imagine sitting down with 800 people for 1-2 hours each and asking them each a dozen questions about their experiences. You'd learn a lot about life and a multiplicity of topics. I've learned the ins and outs of video interviews and have gained insights about human psychology, conducting successful interviews, creating and marketing online videos and websites, SEO, HTML, CSS, Amazon AWS, etc. Etc. If I told you the full vision for Lifey you'd either think I was crazy or genius. The eventual vision is to develop a social media platform that crowdsources human experience and insight through video and makes it browsable and searchable to anyone in the world. The idea being that everyone has experiences and insights that other people in the world could benefit from. The Lifey social network app will essentially further automate the video interview process and will allow people to share more about themselves than they are currently able to. The idea is to enable you to learn from any group of people about any life experience or insight. For example, let's say you're diagnosed with Acute Myeloid Leukemia- you'll be able to browse dozens of first hand experiences and insights from people who live with AML. If you want to learn about any faith, you'll be able to browse dozens of perspectives and experiences from faithful adherents of the faith. If you want to learn about World War 2, you'll be able to access dozens of first hand accounts from people who served in World War 2. If you want to know what it's like to adopt 10+ children, you'll be able to access hours of browsable videos with people who have 10+ adopted children. And the list goes on and on. Not only will Lifey help to preserve life histories for individuals and families, it will help create the world's largest trusted video database of browsable human experiences and insights. Sorry if you tried to access the live Lifey player on Lifey.org in the past day or so. The Lifey player files are stored on another server that was recently compromised by someone in Russia. We'll be relocating the files onto a new server and then the live Lifeys will show up again on Lifey.org. Sorry about that! Lesson learned: Set appropriate permissions/security rules for Amazon Web Services EC2 instances.